It's always difficult to stomach a tough loss. One could resort to blaming the referees or they could just man up and say that it wasn't their night. The pain seeps in more when you look back on all of the memorable highlights and wins of the season, only to come up short in a game. For the Arizona Wildcats, that loss came in the single-game elimination NCAA Men's Basketball Tournament. All of the alley-oops and dunks couldn't lead the team to their ultimate goal: a National Title. It couldn't even lead them to a Final Four berth as they came up short in 45 minutes at the Honda Center. However, the beauty and retraction of the annual NCAA Tournament is that one loss and you're done. On the flip side of that coin, you only need six wins to take home the championship (unless if you are the 2011 VCU squad that went 5-1 only to fall to Butler in the national semifinal). 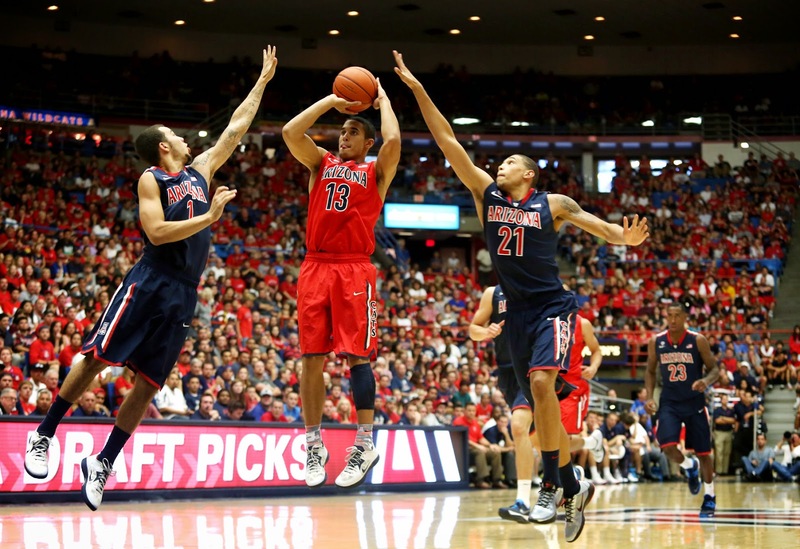 This is a requiem for the 2013-14 Arizona Wildcats' Men's Basketball Team's season. Try saying that three times fast. 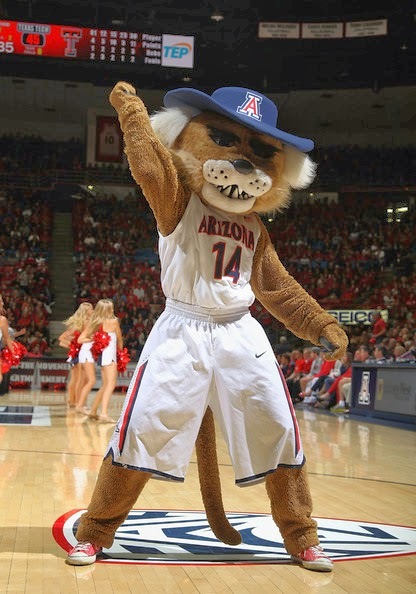 Anyway, as a University of Arizona Athletics supporter, I have followed this team for a number of years. Sean Miller has done a superb job in recruiting athletes to get this team back to where it belongs: the National spotlight. However, Coach Miller has also followed up on the tradition of coming up short in the tournament setting. If you follow Arizona basketball, you might question me on this statement by saying, "Did this guy even see Arizona throttle a No. 1 seeded Duke team in 2011?" Why, yes, I did see Arizona eviscerate an overrated Duke squad by a score of 91-77. The tables turned when Lamont "Momo" Jones pulled up for a transition basket to put Arizona ahead and Jamelle Horne posterized Kyle Singler while Derrick Williams posterized the entire Duke defense. But I digress, because both Derrick Williams and Jamelle Horne each missed three point attempts that would have sent the Cats to Houston. That was the last shot that the Wildcats had a high enough caliber team to scratch the surface of tournament success. Under Miller, the Wildcats have lost the Conference Tournament at the buzzer three times in five years and still advent won one since 2002. However, given the animal that is collegiate basketball and the leviathan that is professional basketball, there is that lure that pulls athletes away from the college game oh so early. This creates a rebuilding project every time a season ends, especially for the superior teams, which challenges every coach. Looking at this 2013-14 squad, I was excited because I thought there was no way they would not win a National title. I was looking forward to a new design on the 2014-15 Arizona Wildcat's jersey that had two stars on the top, one with '97 and one with '14. They were no doubt going to win the 'ship in North Texas. That was almost true, as the Wildcats featured a dominant frontline of seasoned sophomores Brandon Ashley and Kaleb Tarczewski while also welcoming one of the nation's top recruits in Aaron Gordon. The back court featured juniors Nick Johnson and newcomer by way of Dusquene, TJ McConnell. A knock down shooting sophomore Gabe York waited to come off of the bench while an extremely talented and athletic Chester, PA native, Rondae Hollis-Jefferson would come off the bench with him. There was no way they couldn't win. No way. Except for injury. The first game Arizona lost was a 60-58 nail-biting loss at the hands of the California Golden Bears at Haas Pavilion. A close, regular season loss in the midst of a "Gold-Out" is nothing to hang your head for, but Arizona lost there strength in their front court as Brandon Ashley went down with a foot injury. After the loss, things just weren't the same as the Cats barely beat Oregon at the McKale Center and later lost at ASU. In my opinion, losing to Arizona State deems your football or basketball season as a failure, so I personally wasn't too optimistic at that point. However, Sean Miller managed to change my mindset as the Wildcats demolished the Colorado Buffaloes in Boulder by a score of 88-61. They followed up the win by dominating both Cal and Stanford at home, but the fast pace blowouts couldn't keep up. The Wildcats finished their regular season with a loss in Eugene to the Ducks. The Wildcats couldn't turn the tables in the PAC 12 Conference Tournament as they fell to UCLA. Onto the NCAA Tournament. Despite four losses, the Cats managed to convince the committee that they were worthy of the second overall seed, hence the No. 1 seed for the West Region. After playing an uninspired game against the Weber State Wildcats, I wasn't terribly confident in having them win the whole thing. However, they were fortunate when they placed against the Gonzaga Bulldogs, a fundamentally sound yet unathletic team. The Wildcats toyed with the Bulldogs as they advanced to the Sweet 16, set up for a rematch with the San Diego State Aztecs. In what proved to be a much more physical affair than their first game, the two teams played with drive and emotion with the Wildcats emerging victorious. Arizona would then be set up for a date with the Wisconsin Badgers, a team notorious for having four "white" starters. Again, fundamentals. The Badgers team that I saw was not more athletic. They didn't have a single dunk. I don't remember the last time Arizona did not dunk in a game. However, I digress. The Wisconsin players knew how to play, despite their lack of athleticism. They would have to shoot their arms off because they can't drive well, pass as much as possible because they can't set up their own shot, scoot their pivot feet around just enough so it wasn't a blatant travel, and make good decisions. They did all of that and in turn, beat the two most athletics teams in the tournaments field, Baylor and Arizona. It's tough to accept that. So, now that the books are shut on this past season, the question begs: what now? After LaQuinton Ross drilled a three-pointer at the buzzer that put a nail in the 2012-13 team's coffin, I was quite upset yet optimistic. I realized that championships can't be won with even the most talented freshman class because those players lack experience. Next year (this year), the team would be much better though. They'd have a nice combination of Grant Jerrett, Angelo Chol, Brandon Ashley, Kaleb Tarczewski, Aaron Gordon, and Rondae Hollis-Jefferson in their front court. Wait a minute, Jerrett and Chol didn't play for Arizona this year. No, Jerrett was drafted by the Oklahoma City Thunder and is currently in the D-League and Chol was crying on the bench after Arizona knocked out SDSU from the tournament. Realizing this, I can't help but wonder: What if? This is what we as fans and spectators of collegiate basketball need to realize. There are so many what if's that dreaming will leave you dwelling on the past. To hardly even play in college as a freshman and then get drafted has become far too easy. To simply transfer and develop for a year on the bench has become far too easy. The counterargument is that the traditional powerhouse programs can just as easily reload with a talented recruiting class. The Wildcats have arguably one of the better recruiting classes in the nation as they will welcome Stanley Johnson, Craig Victor, Parker Jackson-Cartwright, Tyler Dorsey, Dusan Ristic, and JUCO talent Kadeem Allen on campus this fall. So obviously, next year's team is going to win the National Title, right? Gordon will be replaced by Dorsey. Stanley Johnson will replace Nick Johnson and score more points. Even if Tarczewski leaves, an ambidextrous Ristic will take his role. Even if either Ashley or Hollis-Jefferson choose to leave for the NBA, they'll be replaced by the Victor-Allen tandem. So all is not lost, the 2014-15 squad still has a great chance at achieving what this year's team didn't accomplish. However, if college basketball has taught me anything, it is that senior leadership and superb guard play is what wins games in March. The Cats won't have that leadership unless players stay. Which they won't. They'll have the alley-oops and highlight dunks again, but they won't hold onto one of their better players long enough to season him into a leader. The players who become the senior leaders are the players who weren't talented enough to be drafted earlier in their collegiate career. If I have learned anything, the vicious cycle will continue. 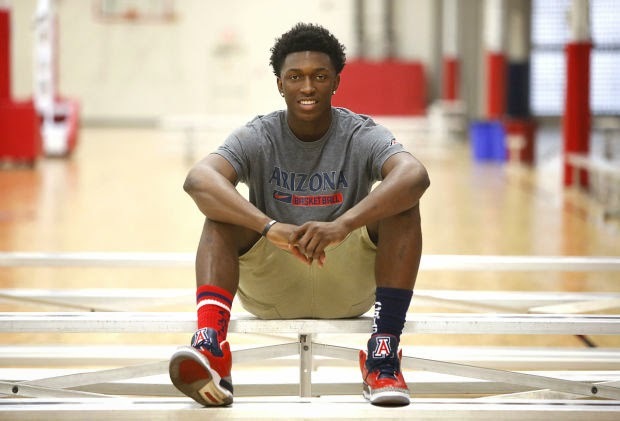 History will repeat itself when Stanley Johnson declares for the draft after he hangs up his custom Arizona-Jordan basketball shoes for the final time when the Cats fall short of the 2015 National Title, just as Aaron Gordon couldn't deliver this year. 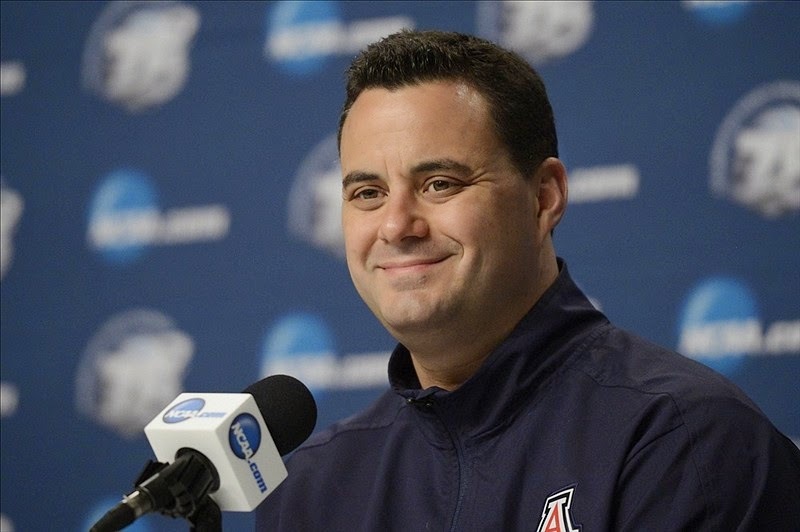 I'm sorry Sean Miller. It's the way basketball is played in the desert and you'll have to coach with the players' best well-being in mind. Perhaps Miller will capture that elusive Final Four berth and National Title when he replaces Mike Krzyzewski as Duke's next head basketball coach. May the 2013-14 Wildcat's season rest in peace.